Like a blind date, In Conversation stages an encounter between two people who never met but whose work and lives share a deep affinity. The work of Alma Allen and J.B. Blunk blurs the line between design and sculpture, with both men creating evocative organic work from natural materials. It also draws a line between contemporary practice and the mid-century when Blunk began his practice. Alma Allen (b. 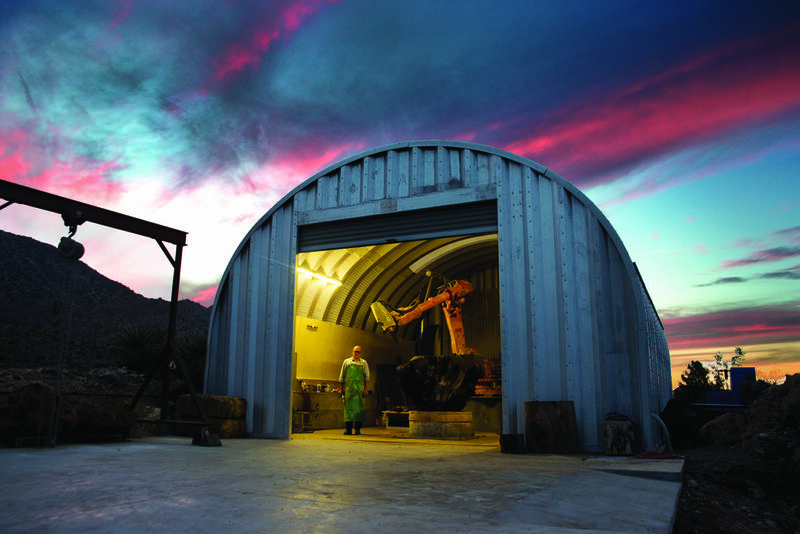 1970) is a sculptor and designer who until recently was based in Joshua Tree, California. 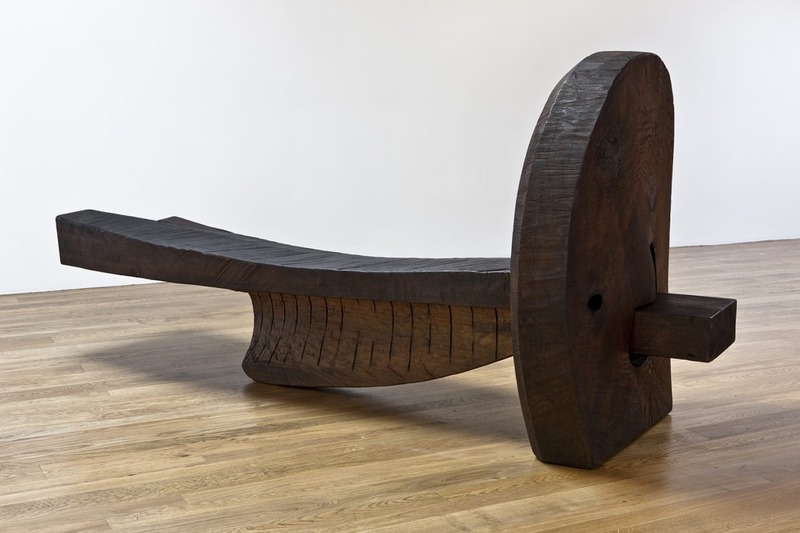 His early work includes small, tabletop-scaled objects such as bowls, trays, and vessels in wood and cast bronze. Organic and talisman-like, these small objects eventually led Allen to the much larger work he makes today. Elegant and amorphous, and sculpted from marble, travertine, bronze, and walnut, Allen’s current work is made with the assistance of a giant robotic arm. 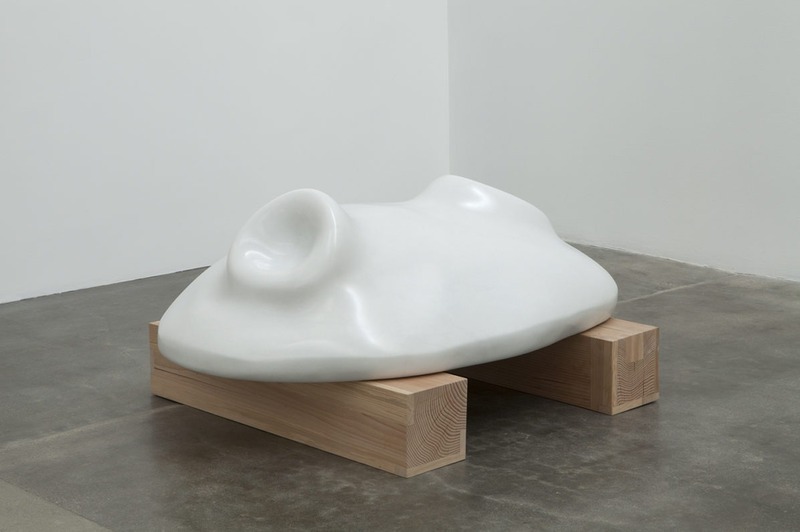 Pairing Allen’s work with that of J.B. Blunk (1926–2002), the Northern Californian artist and designer who seems an obvious precursor and inspiration to the younger sculptor, establishes a dialogue between two sympathetic voices. 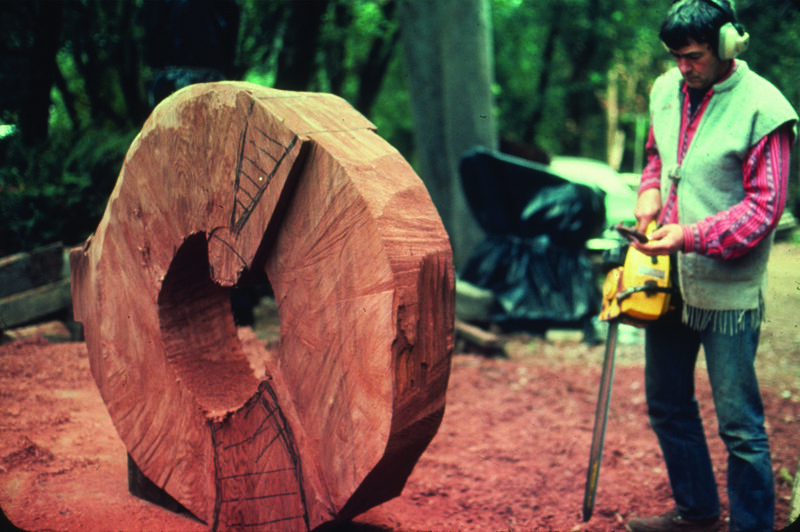 Blunk began making work in 1962—mainly furniture and sculpture in redwood and cypress, some of which is monumental in scale. 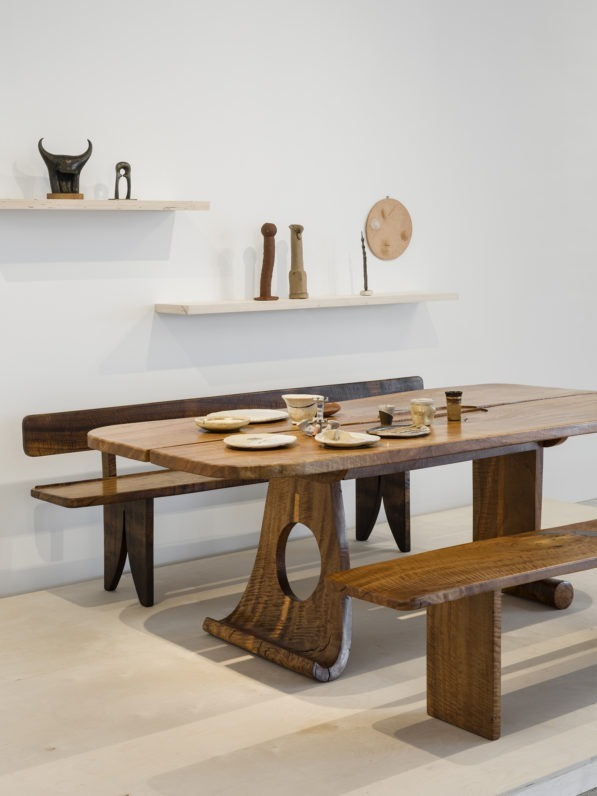 He also worked in clay, stone, and cast bronze, and like Allen, his work blurs the line between furniture, functional objects, and sculpture. Blunk’s work is also organic in nature but has a rougher, more rustic quality since his tool of choice was a chainsaw and he wasn’t interested in polishing his pieces, preferring a more natural aesthetic. Both men designed and built their own homes as well as many of the furnishings and objects in them. In addition to small early pieces, large-scale works, and process models, the exhibition features photographs of the homes and studios of both Allen and Blunk, creating a parallel conversation between the work and point of view of two contemporary photographers, Lisa Eisner and Leslie Williamson. 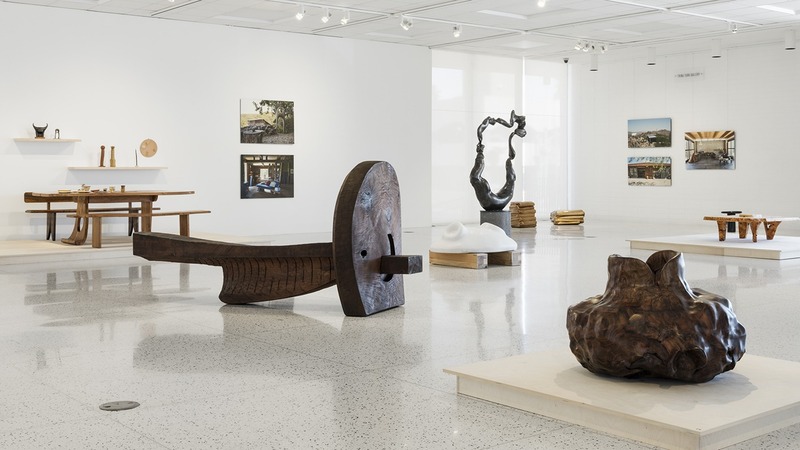 “In Conversation: Alma Allen and J.B. Blunk” is organized by Palm Springs Art Museum and curated by Brooke Hodge. IMAGE 1: In conversation: Alma Allen and J.B. Blunk installation at Palm Springs Art Museum. IMAGE 2: J. B. Blunk American, Dreamlock, 1982. Courtesy of the J.B. Blunk Collection and Blum & Poe, Los Angeles/New York/Tokyo. IMAGE 3: In conversation: Alma Allen and J.B. Blunk installation at Palm Springs Art Museum. IMAGE 4: Alma Allen American, Not Yet Titled, 2014 . Collection of Palm Springs Art Museum, Gift of Ronnie Sassoon. IMAGE 5: J.B. Blunk, 1978, photo Mike Conway, © J.B. Blunk Estate. IMAGE 6: Alma Allen with his robotic arm in Joshua Tree, California, 2014. Photo Lisa Eisner. Gallery Talk: Brooke Hodge, of the PSAM discusses "In Conversation: Alma Allen and J.B. Blunk"